A wealthy Democratic donor club plotting the future of the liberal movement hopes to be fighting for reparations by 2022, according to a document obtained by the Washington Free Beacon from the Democracy Alliance's spring conference this week in Atlanta. The reception, "Way to Win: 2022 Victory Party," was presented as a look forward at what's possible if Democrats can be effective in coming elections. "It's 2022 and we are celebrating policy victories across the nation: Medicare for All and Free College, and next on the agenda is Reparations," the group projected, according to an invitation to the event. "Take a ride in our time machine to hear from the true political geniuses who made this happen," it says. "Because we’re governing with gusto, we’re seeing victories up and down the ballot—including winning a governorship in Texas and putting 38 electoral votes in grasp by 2024," it says. "Stop in 2020 and 2019 when local power builders turned Arizona and Florida solidly blue and established Virginia as a progressive governance juggernaut." 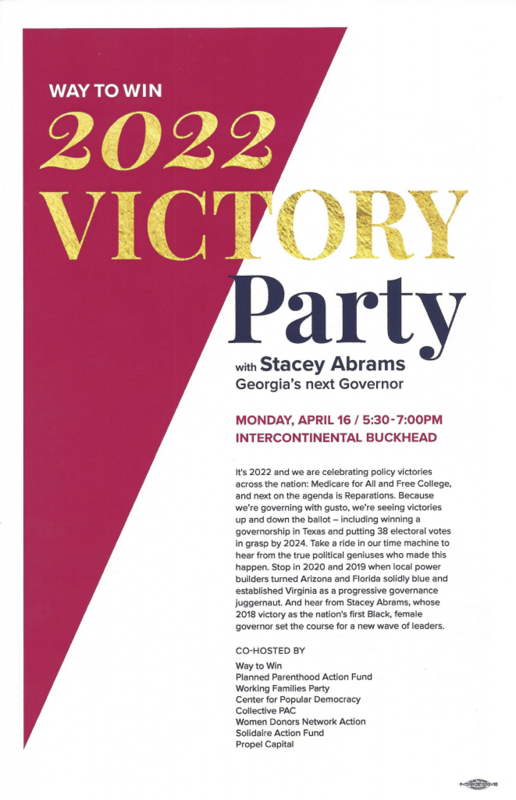 The event was headlined with a speech by Georgia gubernatorial candidate Stacey Abrams, who the group predicted would "set the course for a new wave of leaders." 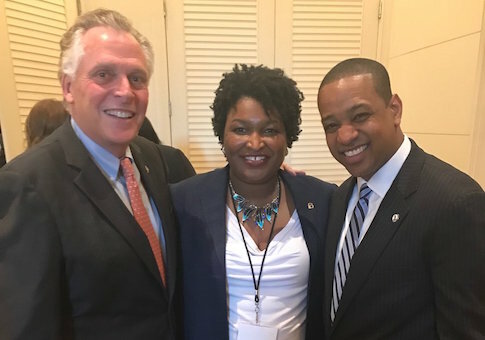 She was pictured on the night of the event with McAuliffe, who was also a featured speaker at the conference and is considering a run for president in 2020. Representatives for the DNC, which had a substantial presence at this week’s conference, did not respond to a request for comment on whether it thinks a push for policies such as reparations would be politically wise for the party. The Democracy Alliance is the left's biggest donor club and has been embraced in recent years by party leadership. Its donor conferences have featured appearances by Democratic minority leader Nancy Pelosi and prominent Democratic senators such as Elizabeth Warren (Mass.) and Kamala Harris (Calif.). The "2022 Victory Party" event was cohosted by a number of prominent liberal groups such as Planned Parenthood Action Fund, the Collective PAC—a collection of entities with a mission to build "black political power"—and the Women Donors Action Network, which seeks to leverage the power of progressive women donors. The Solidaire Network, a group of wealthy liberal donors who foster protest and direct action, was also involved with the event. The Solidaire Network joined forces with two other liberal groups to form a "resistance" fund that combats "immediate threats" to "immigrants, women, Muslim and Arab-American communities, black people, LGBTQ communities, and all people of color" and push back against Republicans. The Center for Popular Democracy, a New York-based progressive advocacy group, was also a cohost. The Center for Popular Democracy's sister organization, the Center for Popular Democracy Action Fund, leads a massive $80 million anti-Trump network that spans across 32 states. Rep. Keith Ellison, the deputy chair of the DNC, last year publicly threw his support behind the network. "This national network, led by working class people of color and immigrants, will supply the power and the fight we need to resist the Trump administration's all-out assault on American values," Ellison said. "I look forward to standing with CPD Action's leaders in the streets and in Congress to win real progressive change." The Center for Popular Democracy, which has partnerships with more than 50 left-wing activist groups across the country, is also funded by the Democracy Alliance, whose members each vow to steer hundreds of thousands in funding to approved groups of the secretive donor network. Neither the Democracy Alliance nor any of the event cohosts responded to requests for comment. This entry was posted in Politics and tagged Democracy Alliance. Bookmark the permalink.